Mark Knoller is a White House Correspondent for CBS News, temporarily reporting from the CBS News Pet Desk at the White House. You had to feel sorry for India the Cat as the least-known member of the First Family. She never got quite the same level of public attention or affection as the Bush Family dogs Barney and Miss Beazley. 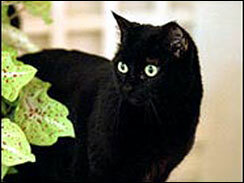 Quietly this morning, the First Lady's press office let it be known that India, a black American Shorthair, died yesterday in the White House at the age of 18. The story goes that India got her name from one of the Bush's twin daughters, Barbara. When she was nine, she named the cat for former Texas Ranger baseball player Ruben Sierra – who was called "El Indio." The Bush Family also took to calling the cat "Willie" or just plain "Kitty." One of India's favorite pastimes, according to First Lady Laura Bush, was to sun herself on a chair near the Palladian window at the end of the long interior hall of the White House residence. She led a quiet and pensive life. Not so Barney and Beazley, who are the media hounds among the White House pets. There's no question Barney is the president's favorite – and often hangs out with him in the Oval Office. The Scotty recently scored points with Mr. Bush by biting a reporter's hand. Barney is also the star of annual White House Christmas videos and there are far more photos of him and Beazley on the White House Web site than there ever were of India. But the disparity in treatment of the pets was most in evidence when the First Family would go to the ranch. Barney and Beazley would often travel aboard Marine One with the President and First Lady – and then be carried up the stairs of Air Force One in the Bushes arms. But not India. She was relegated to a pet carrying case and driven out to Andrews in a staff van with the luggage, then carried up the backstairs of the aircraft, the same steps used as the press. Perhaps that's how she lost her nine lives.